A Covert Action Lobby Effort by NAB? On 2/25/15 a new Twitter account, @JohnnyInterfere appeared with its first Tweet, an innocuous “Just set up my new Blu-Ray player!” Several more innocuous tweets appeared including ones about pancakes and Girl Scout cookies. Then on the eve of SXSW Wi-Fi became a recurring issue. Yesterday the focus became the issue of whether TV white space was an interference threat to OTA DTV. 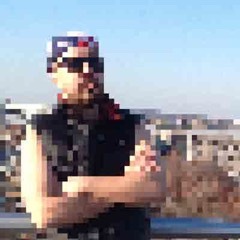 There was a link to a Re/code blog post entitled “FCC’s hot mess of a database may not bode well for future airwaves sharing”, one your blogger had retweeted as soon as it appeared. It seemed odd that Re/code had been so interested in the quirks of the TVWS databases, but maybe it was a tip off from industry. Just prior to the appearance of “Johnny”, NAB launch a surprisingly aggressive commenting campaign against Adaptrum’s, a small Silicon Valley firm, request for a waiver of TVWS tower height limits in an obscure area in northeast Maine that lacks much broadband coverage and totally lacks any UHF TV signals. We note that former long term FCC stafferJane Mago recently retired as NAB General Counsel and EVP/Legal Affairs and was replaced by another FCC alum, Rick Kaplan, who was not at FCC as long as the well respected Ms. Mago. It is interesting to note that when he first arrived at NAB, it was proudly announced that “(w)hile with the FCC, Kaplan had a reputation as a consensus-builder and a leading voice on spectrum policy, championing causes such as spectral efficiency and spectrum sharing”. Shortly after Comm. Baker took over CTIA, the 2 most confrontational CTIA staffers left the organization and CTIA’s spectrum advocacy has become less shrill and confrontational. Has NAB now assumed the mantle of CTIA’s former confrontational approach? Is NAB now behind the well funded “covert action”/“false flag” operation @JohnnyInterfere? What happened to Mr. Kaplan’s former interests in being a “consensus-builder” and “championing causes such as spectral efficiency and spectrum sharing”. In any case, if NAB would sit back for a second, they might realize that the decimation proposed of the FCC’s spectrum enforcement staff is a much greater threat to all broadcasters - not just TV broadcasters - than problems with the TVWS database that can be addressed in a less confrontational approach than anonymous ads in the Hill and mysterious Twitter pages. So let’s work out database issues in a less confrontational forum and all collaborate on the issue of saving spectrum enforcement at a reasonable level. Note that our above blogpost clearly said “MSS client Adaptrum” and that by Googling both “Marcus” and “Adaptrum” that the long standing relationship between Adaptrum and MSS is very clear and well documented. The NAB staff is also well aware of the MSS/Adaptrum connection going back to the FCC Lab tests of TVWS technology. Googling NAB and “JohnnyInterfere” or “Johnny Interference” results in no such connection. The @JohnnyInterfere Twitter page has no mention of NAB and the multiple ads in The Hill also have no mention. Was the new campaign “covert”? Readers can decide for themselves. This “education campaign” ’s connection with NAB was only revealed in the public domain after our tweets and blog post. The NPRM in Docket 14-166 addresses a messy problem that is a result of private interests creating a de facto allocation and service rules for nonbroadcast wireless mics in TV spectrum and the FCC “turning a blind eye” to the problem for decades. While only analog NTSC television was used in the UHF spectrum, “UHF taboos” based on 1953 projections of UHF TV receiver performance severely limited the use of TV channels in order to prevent interference to desired signals from transmitters on certain frequencies up to 15 channels away. This resulted in a general pattern of the use of every 6th channel in a given city. (Hence the “old” Washington TV channels were 14,20,26,32.) In the 5 channels between UHF assignments in a given city TV stations and other high power transmitters were not possible due to TV receiver limitations and there was thus no opportunity cost for using these 5 channels for low power wireless mic use. Thus FCC authorized broadcasters, CATV operators and Hollywood producers to use “vacant” UHF channels for wireless mics but severely restricted use to these groups under the terms of §74.831. While subtlely acknowledging illegal uses, they never asked that they be normalized and no other wireless mic user or manufacturer spoke at all in the 3 year long proceeding! In the new twin FCC NPRMs that deal with wireless mics, Dockets 14-165/166 we have the following proposed band plan for the “duplexer gap” between the cellular uplinks and downlinks in the repurposed 600 MHz TV spectrum after the incentive auction. Could Lion King and their corporate parents at Disney afford to pay for spectrum use? Taylor Swift has been in the news and is well known for saying “music should not be free”. We see from the ad below what she thinks is a fair price for her concerts. Perhaps Ms. Swift will tell us whether she thinks spectrum use for high priced concerts should be free? Yes, in a small section of Manhattan it will be used for a few hours a day. In Central Park and other concert venues it will be used for a few hours a few days of the year. Near some large churches it will be used a few hours a week. But the rest of the time it will be denied to all other users, both licensed and unlicensed. At present wireless mic licensed users have priority access to “vacant” TV channels. The new proposals will make them the sole possible user of 4 MHz, deny that spectrum 24/7 to other users even if there is no wireless mic use within 100 miles, and guarantee the very low utilization of that spectrum 24/7 in 50 states plus territories. Why? pay for spectrum access either through a variant of the UK system spectrum leasing system managed by Arqiva or through a femtocell-like system provide by cellular operators. For more details on the femtocell-like alternative, see an interview with your blogger in the wireless mic blog RF Venue. In the UK,all wireless mic users (PMSE in UK jargon) have been paying for spectrum for over a decade. Has it resulted in the “the day the music died”? This 4 MHz proposal is the worst example of Command & Control spectrum policy since it was discredited in the Spectrum Policy Task Force report in 2002! Our recent FCC filing in Docket 14-166 expands on the above discussion. Nationwide Unlicensed TV Whitespace Use at Last! Previously, OET had authorized database systems to only provide service to TV white space devices in the East Coast region, specifically in the states of New York, New Jersey, Pennsylvania, Delaware, Maryland, Virginia, and North Carolina and in the District of Columbia (Washington, DC). We now have nationwide availability for the first time. In a related matter, on February 27 FCC announced a 45-day public trial of Google Inc.’s TV band database system. Spectrum Bridge, Inc. and Telcordia Technologies, Inc. were previously approved as database administrators. 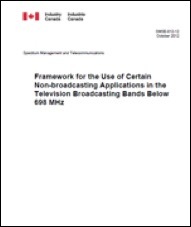 Today, Industry Canada, the FCC’s Canadian counterpart with respect to spectrum policy, published its TV whitespace decision after its rulemaking process. As in the US they will allow unlicensed whitespace devices in TV spectrum subject to geolocation and a database check. Like in the US they will have multiple database administrators. The management of the radio frequency spectrum has traditionally been a centralized process, with the access to spectrum overseen by a regulatory body. However, as technology has progressed, methods allowing dynamic spectrum access have begun to be developed to improve spectrum efficiency. A shift away from conventional licensing approaches could lead to a more flexible, adaptive administrative environment by enabling opportunistic use of the radio frequency spectrum. Such techniques for the use of TVWS have the potential to improve spectrum efficiency while facilitating the introduction of new wireless communications applications in Canada. Some respondents express some apprehension about the introduction of TVWS devices due to the potential for rapid proliferation, especially in the context of licence-exempt operation among licensed systems. On the other hand, appropriate technical requirements and the ability of these devices to adapt their operation in real time should ensure that incumbent users do not suffer harmful interference. Industry Canada believes that the regulatory approach described in this document will provide the necessary measures to address these concerns. Industry Canada will also closely monitor international regulatory developments, and will make appropriate regulatory changes as further experience is gained. It is noted that TVWS rules in the United States have been finalized and remaining legal obstacles to related TVWS deployment have been resolved. The development of rules and regulations for TVWS use are also moving quickly in many other countries, including in the United Kingdom, where rules development is particularly advanced. Despite the potential that repurposing of some TV spectrum below 698 MHz in the United States might lead to calls for similar action in Canada, Industry Canada does not see this as a reason to delay the introduction of TVWS devices. If Canada were to follow the United States, available spectrum would be reduced and fewer geographical areas would be available for the operation of TVWS devices. However, proponents have indicated their belief in the ongoing viability of TVWS use regardless of whether such changes take place. It is expected that the introduction of the use of TVWS devices will enable the development of new techniques for managing the radio frequency spectrum while easing spectrum shortages and enabling more options for wireless broadband and Internet services for consumers. It is unclear if Industry Canada has decided to use the same obsolescent R-6602 propagation model that FCC used and that overprotects TV reception or is using a mode accurate model or has just deferred the issue for further consideration. More later. On April 19, the traditional Patriot’s Day in my home state of Massachusetts and the anniversary of the “shot heard round the world” that started the American Revolution, FCC approved the equipment authorization application of Adaptrum, Inc. for a TV white space device for unlicensed use in the UHF-TV band under the rules adopted in Docket 04-186. The unit was approved as shown above for the frequency range 473.0 - 695.0 MHz, TV channel 14-51, and a transmitter power of 0.617 W. The approval include permission for use of antennas with a gain up to 10.15 dBi, so the device is capable of the maximum 36 dBm, almost 10 dB higher than the only other device that has ever been approved. Adaptrum also announced a field test of its equipment in rural Nottoway County Virginia. This is an economically challenged area with little broadband connectivity due to disinterest of the mainstream carriers and lack of appropriate technical options in the past. Adaptrum hopes to show how white space technology can improved connectivity in such an area. Adaptrum, founded in Silicon Valley in 2005, is MSS’ oldest client and we are proud to have played in a key role in assisting them to reach this point. Today, the Federal Communications Commission issued a Public Notice announcing that the Office of Engineering and Technology (OET) has approved Spectrum Bridge Inc.’s television white spaces database system, which may provide service to devices beginning January 26, 2012. OET has also approved a device by Koos Technical Services, Inc. (KTS) as the first product allowed to operate on an unlicensed basis on unused frequencies in the TV bands. The KTS device will operate in conjunction with the Spectrum Bridge TV band database. The database announcement says the database approval is effective January 26, 2012. NAB reported some problems during testing and asked for both more testing and another round of comments. FCC rejected the need for more comments but required that the problems identified to date be fixed. However, the initial implementation of the database will be limited to “ to the Wilmington, NC market, specifically to the city of Wilmington and New Hanover County, NC” due to problems with the FCC registration system for nonbroadcaster high density wireless microphone usage sites such as concerts. Your blogger has serious doubts whether the FCC provision for registering these wireless miss will be practical. Time will tell. Above is the first equipment authorization approval granted to Florida’s Koos Technical Services, a firm that seems to have some partnership with Spectrum Bridge. While the Commission’s Rules do not forbid this type of relationship, one wonders if anyone ever thought about it from the policy viewpoint. The FCC grant is surprising in that the approved spectrum is not UHF, but rather 177-213 MHz in the upper VHF band. This is the middle of channel 7 to the middle of channel 13. 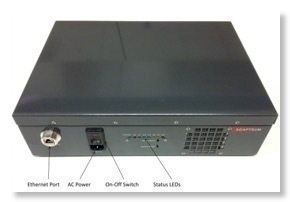 The device’s manual states that “it is designed to provide a reliable wireless connection for digital communication in selected TV bands in the 174 – 216 MHz (VHF) or 470 - 698 MHz (UHF) frequency ranges.” The manual also states the power amplifier “provides up to 1 Watt (30 dBm) of RF output power” - but the approved power limit is 0.1 Watt. The manual states the data rate is “1.5 or 3.1 Mb/s” with a 6 MHz channel bandwidth. 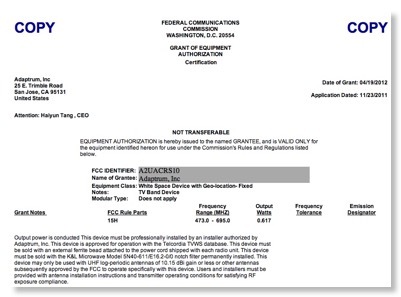 Indeed the test reports KTS submitted to FCC repeatedly mention “Transmit power 25 dBm” or 0.316 W, yet the authorized power is 0.1 W. So it is clear that the parameters that were approved are not the ones in the original submittal to FCC. Perhaps KTS had to back off its intended performance to meet FCC emission limits. Previously, several mainstream manufacturers complained to FCC that they could not meet the out-of-band emission requirements in this band with off-the-shelf equipment designs. However, MSS client Adaptrum demonstrated to FCC in a March 2011 filing that it could comply with the OOBE limits. Congratulations to Spectrum Bridge and KTS on these first approvals. We hope there will be many more soon. Unfortunately, that paragraph in the December 22nd FCC notice caused a bit of confusion. The project in Wilmington has approval to move forward but our certification is finalized and valid starting January 26th, 2012. Rumor has it that there are some wireless microphone channel optimization efforts underway and the administrative cleanup will take until the 26th of January. Therefore, the staggered start. Fear not, certified devices are now here and implementation plans can move forward.